Lion City Pride in "Rango"! When it comes to noteworthy geekism, Red Dot Island somehow manages to take things to a level worthy of a whole lot of Singa-pride. 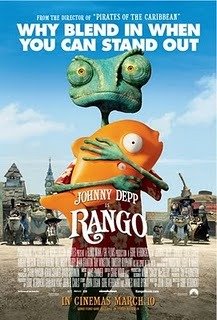 Thanks to ILM Singapore, who recently gave that geek-level a boost with "Rango" - an animated feature film by Paramount Pictures/ Nickelodeon and directed by Gore Verbinski (he who is famous for the "Pirates of the Caribbean" movies). The computer-animated movie is a Western comedy about an over-imaginative, metrosexual pet chameleon (voiced by superstar Johnny Depp) turned small town sheriff-hero, via some dusty spiritual journey.